Welcome to our Family Camping Fun Feat. Hillary Tent website. Here you will be able to find top quality suppliers of Hillary, Coleman, Nemo, Wenzel, Greatland and Springbar Tents in the styles and look you want at a price that’s sure to fit almost any budget. You’ll also find others companion products by these fine companies as well, such as sleeping bags, cots, cookware and much more. Below is a quick blurb on the organization that inspired this site. Again welcome and enjoy the information provided. Don’t forget to leave a comment or ask a question. Although there have been a few complaints regarding the equipment, our research shows that there are many who swear by it as a reliable and affordable option. And if you are not serious about camping and you’re looking for a cheap tent to pitch occasionally in fine conditions, Hillary tents could be a more than passable option. 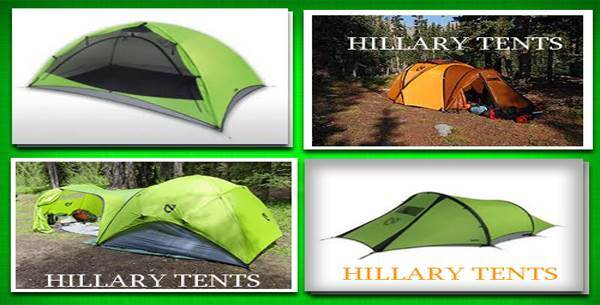 The Hillary tent label manufactured by three different tent companies and sold by Sears department stores. Options range from backpacking dome tents to large-scale family dome tents with covered picnic flies. The brand also includes accessories such as Tarpaulins. Almost all of the tents come with a rainfly and according to Sears, are very easy and simple to assemble. In terms of overall value compared to other tent brands, the Hillary tent is on the lower end of the scale especially for very serious and dedicated campers. However, if you are an occasional camper (in fair to nice spring or summer weather) or its kids’ night in the back yard, then this tent line may be just the thing for your pocketbook.